Finding it hard to sleep? Understand that you are not alone and there are many people around the world who are experiencing this problem. What could be the effective solution to sleeplessness? or finding it really hard to disconnect from the surroundings to sleep tight? There are certainly many ways to achieve sleep like indulging in exercise routines, stress management techniques, yoga, meditation and other methods. I have myself tried yoga and it really helps but sometimes I really find it difficult to stick to a routine especially with my busy schedules. There is no doubt that the above mentioned techniques are the best but bringing them into practice is the difficult part. For the busy lot who don’t have time to indulge in such natural ways here is a simple solution that might turn the tables for you. This simple smart device can actually put you to sleep in a better way. It not only helps you to sleep but can also be used for general relaxation and breathing. Wondering how? Read more to know about this exciting device. It a smart device and a mobile app that guides you and induces sleep. It uses the same technique followed by most of the resperate devices by lowering the blood pressure and inducing relaxation inside the body. Besides, this technology reduces the neural sympathetic activity which directly helps in you in getting the required sleep. Great isn’t it? 2breathe is a smart device and a mobile app that guides you and induces sleep. The concept of mindfulness meditation and breathing techniques are utilized in 2breathe which helps to induce sleep. It helps you to focus on breathing patterns with the help of guiding tones. Firstly, this is a patented technology which helps you to breathe rhythmically and guide you into peaceful sleep disconnecting your mind from the present. It helps the body and mind to relax in few minutes from all worries by stopping the neural sympathetic activity that has been running all day long. Further, most of the resperate devices are FDA approved and a drug free alternative for those suffering from hypertension and stress. All the devices that belong to the resperate category are now being included in the treatment methods of American heart association. This is because this technology has proven to reduce hypertension and induced sleep in a survey conducted on a test group. Now this same technology is available in smart phones in the form of 2breathe. Step 1: Breathe: Get the sensor attached around your abdomen and start breathing. It employs a low energy Bluetooth to send your breathing patterns to your Smartphone. Step 2: Follow: Once your pattern is identified 2breathe converts that in real-time into tones that will help you to continue with slow breathing and prolonged exhalation. All you have to do is breathe with the tones and don’t worry if you aren’t following the tones. The device is capable of automatically adjusting the tone according to your breathing. Step 3: Fall asleep: In a couple of minutes your neural sympathetic activity will be decreased. Your stimuli functions will be put off which helps your body to relax and have peaceful sleep. 2 breathe automatically detects whether you slept or not and shuts down the device after use. Normally in olden days people used to sleep as soon as they hit the sack and that’s because they lead a simple life with a healthy diet. There were comparatively less stressors unlike what we are facing today. Now it is more like the moment you step down to sleep the more and more anxious thoughts start conquering our minds. Usually while we go to bed our mind disconnects from the surroundings slowly and swiftly. Our muscles and other body parts starts relaxing lowering our blood pressure and deactivating our sensory functions for the time being. Imagine at this point suddenly your mind pops out with a question “how will I complete my work within the deadline” or “how will I manage my problems” your whole body is put into trouble once again. These sorts of thoughts actually hinder the normal sleeping process and prevent your body from relaxing. So what is the way out to prevent such wakeups and sleeplessness? What to do with these anxious thoughts? The simple way is to seek help by using 2breathe which helps to calm the overactive mind. It helps you to focus on breathing patterns with the help of guiding tones. These tones help you to exhale and inhale progressively in a slow pace which turns down the neural sympathetic activity. This whole process actually takes a couple of minutes alone and by the end you would be sleeping with a relaxed mind and body. Further, the concept of mindfulness meditation and breathing techniques are utilized in 2breathe which helps to induce sleep. It is all about rhythm, synchronization and breathing which eventually lead to restful sleep which is much needed for the body. The notes of the tones are so soft that it awakes the emotional part of the brain which helps in relaxation. I actually felt using 2 breathe was much better experience than counting numbers of thinking about something that never existed. When I counted from 1 to 100 I actually used by cognitive part of the brain more and more only to make me restless. While 2breathe was such an easy way to get rid of my active brain and put it to sleep for the time being. 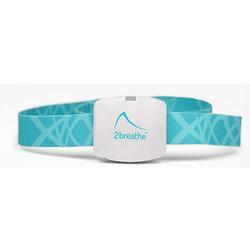 2breathe’s is a user friendly device that adapts according to the user’s ability to follow the guidance. The tone’s keep changing according to the user on a real-time and is not pre-recorded. This helps to create a personalized breathing routine and due to this 2breathe is an entirely functional and product compared to others that are available in the markets. There are many sleeping apps and aids. Why choose 2breathe? 2breathe is all about natural tones which are adapted on a real-time basis. It helps to calm down the brain activity. Also, it puts you to sleep by using breathing techniques slowly and swiftly. It works like as if someone is guiding you to inhale and exhale to attain a point where you let go all worries and just get some restful sleep all night. Without this device trying to do all this alone is almost an impossible task as you won’t be able to concentrate. This is one best chemical free alternative and the best app available till date. It is proven that around 164 million Americans suffer from sleep issues and around a quarter of this population are using sleep aids. Using 2breathe will help to resolve sleep issues and help your body to relax only to become better and healthier. There are many sleeping apps and aid available but majority of them have pre-recorded tones and messages that actually don’t suit your personal needs. 2breathe is an interactive platform which adapts according to the user’s needs. Moreover after every session a report is generated that shows a breath graph and the duration to track the performance. Are there any side effects using 2breathe? There are no side effects using 2 breathe as it is a chemical free alternative. It only helps to put you to sleep with natural tones. According to reports and user feedbacks, it is said that this device actually helps in controlling stress and anxiety issues. Moreover spending at least five minutes on a devoted breathing routine is like freeing your body from ailments without the help of medicines. You can ask your health expert before using this device for ruling out your concerns. Ask your doctor if you suffer or suffered from ischemic heart disease, bradychardia, stroke issues and heart failure. Never use this device when you are doing something which needs concentration and alertness. Strictly avoid it during driving. It is only worth to use while sleeping. If you feel any mood change or a negative impact then stop using it for a while and contact your health expert. Remember it is not a medical device. The following devices are the only platforms that support 2breathe and unfortunately it doesn’t work with android phones as of now. iPad 3, iPad Air, iPad Mini, and iPad Pro. You can share the sensors and your sleep session reports will be saved under one account. That will make it difficult to track your progress. You can download the apps in your respective smart devices and share the sensory to get a restful sleep. Conclusion: 2breathe is a revolutionary product and it is really an add-on for those who love to use chemical free alternatives for health related issues. This small device can actually help you to sleep, and keep track of your sleep by generating reports. It is more like a super-mom singing a soothing song which automatically takes you to the world of sleep and dreams. This product is worth a try and comes at an affordable price range.